Allows me to revoice chords. Exporting MIDI would be nice, but isn't really essential. This is more for sketching stuff out. I feel this app exists and has been discussed here before. But I don't seem to be able to find it. Can anyone help me? Maybe it was Chord Bud? I like this one a lot, too. I only have it on my Android phone though. Here is the free one. It’s $5 to unlock it. You do however have iReal Pro that is very good too. Both have the deeper inversion voicing and chord placement features you're after. Just a few that came to mind. I think chordbud was the one I was thinking of. Doesn’t quite do what I want but interesting. I use irealPro for piano practice. 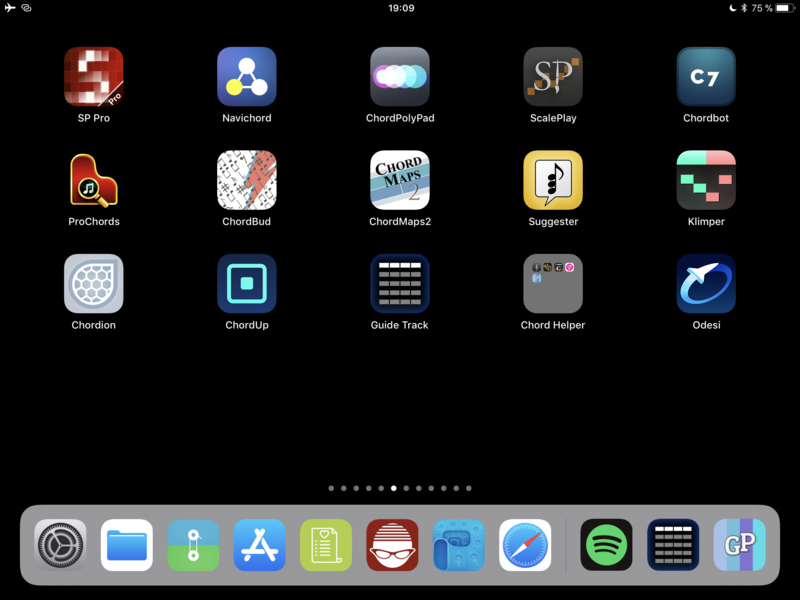 Good app for real book stuff. I do have chordbot and use it but don’t love it. Ho hum. 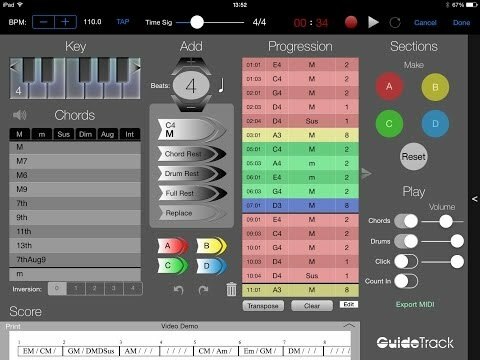 Chordpolypad will do all that for playing chords. You can set up a pad for any voicing you please. I don't recall if it has a sequencer built in. But if it doesn't, it's easy enough to set up and just play your progression into a sequencer. You can also program each controller pad as an X-Y pad on whatever midi channels you please, so as to get some expression into the rendition. ChordBud is fairly new and seems to still get new stuff. It might be worth it to contact the dev if you had a specific feature in mind. Sort of on the subject has anyone tried hook theory plus? odesi only allows you to do 4 bar progressions, right? That seems strangely limiting. Looks really cool. I would be interested to hear how you like it after you have a bit of time checking it out. I can get it for $5, which seems really cheap and totally worth it if it has a smart workflow and is quick to use. I have a lot of these as well. I would suggest you check out Keynality. It has a big chord pad layout with a scale locked melody KB, and supports .sf2 files in the sampler. I really like it. Is iRealPro only useful if you want to learn and play Jazz stuff? Seems very jazz oriented. it does have other styles in it including an IAP just for blues. Its really useful - often used by musicians just to have the chord lead sheet in front of them when performing. But what it lacks and i really wish it had - is MIDI output support and AUv3 instrument plugin hosting. Both of which would make the 4 instruments inside the apps more realistic and less "cheesy"
Playing around mostly and testing this and that. This is exactly the problem I'm having with it. I'm just so tired of the cheesy MIDI instruments. I've been trying to figure out how to export the XML MIDI files but haven't had any luck just yet. I've just given up for the evening and will give it a try another night! Frustrating for sure. TBH - the logical end point for anyone seriously wanting to go "non-cheesy" - is band In a box on widows/OSx. But i'd really like to see iReal Pro output MIDI - but more to allow experimentation - sending a keyboard part to animoog, a jazz drum part to RuisMaker and so on. Thats where things get cool in the iOS sphere. If one simply wants arranger high-realism PG music's Band In A Box beats it all simply because it uses real musicians for RealTracks backing parts- eschewing MIDI altogether if desired. Hi, which iOS apps would have the function of generating rhythmic accompaniment from a chord sequence? Ex. I play sax and I have a playlist to present (Bon Jovi, The Police, Beatles, etc) but depending on the occasion the arrangement needs to be different. Like bossa nova style, jazz, piano only, more dance, more reggae, or more rock. Would any app have that power? Thank you! 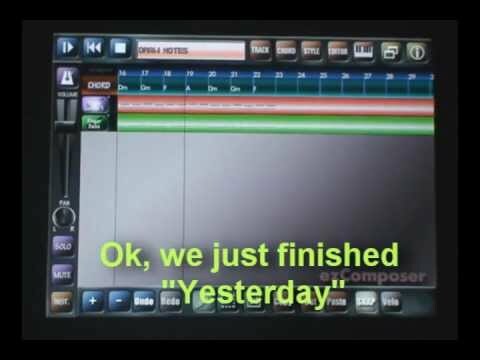 And using any of his drum apps generate a rhythm (each app has its own style). Yeah, this certainly sounds like a job for iReal Pro. Does it respond in real time to incoming chords played on a MIDI keyboard?